We are writing to invite you to celebrate with us fifty years of linguistics at the University of Connecticut. Founded in 1967 with Arthur Abramson as its chair, the Department of Linguistics at UConn has contributed many fundamental insights to the theoretical and experimental study of language. The department has a proud tradition of exceptional scholarship and a deep commitment to graduate education. Students of the program have now successfully defended over 150 dissertations and gone on to many prominent positions in the field. We are writing to you as Ph.D. alumni of the department to ask you to join us in celebration of these achievements on September 7-8, 2018 at the University of Connecticut at Storrs. We are planning a slate of events including talks, discussions, poster sessions and a dinner reception. We would like to take the opportunity of this reunion to reflect on the scientific discoveries made at UConn over these 50 years, to hear about what our alumni are working on, and to show everyone what the department is now. Though the other events are still being planned, there will definitely be poster sessions for presenting current research which will be open to all members of the UConn linguistics community who attend, including alumni and current grad students, as well as current and former faculty. We ask that everyone who receives this email please fill out the form at the link below to let us know whether or not you wish to receive further communications about this event, whether you plan to attend and whether you would like to present a poster. When we have a sense of numbers we will follow up with details for those interested in attending. A memorial for Arthur was held on May 3 at Haskins Labs. At the link below, find a video of the memorial featuring a remembrance by another former head of Linguistics, David Michaels (@1:01:25). Whether you plan to attend or not, please consider making a charitable donation to the department. The challenges of maintaining an internationally prominent Ph.D. program at a state-funded public university have not changed. Your donations will go towards the support of graduate research and education in Linguistics. We are sending this email out to all the Ph.D. alumni for whom we have reliable contact information. There are quite a few alums, however, that we do not know how to contact. Find the list at the end of this email. If you are in contact with anyone on the list, please feel free to forward them this email. There is also a box in the RSVP form for entering the emails of people on this list. We hope to see you in Storrs this fall to celebrate the legacy of UConn Linguistics! 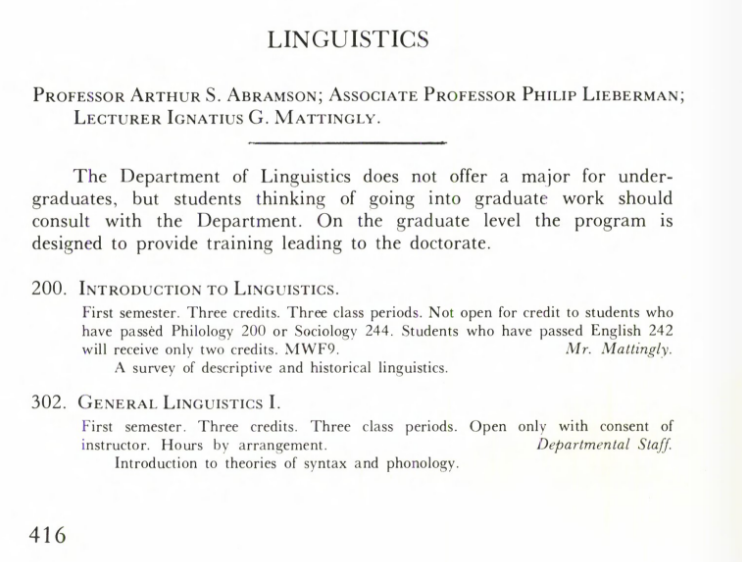 The first appearance of the Linguistics Department in UConn's course catalog.